This collection contains material that have some association with the Cathedral and Cathedral Activities, including newspaper cuttings, scrapbooks and items of research work. Collection of records and material relating to the sculpture Vernon Hill who created sculpture throughout the Cathedral. 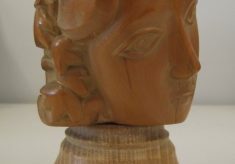 Includes a collection of Maquettes for sculpture work. Collection of materials from John Clark. 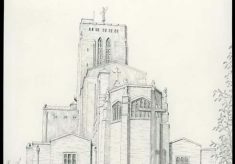 The collection contains a collection of pencil drawings of churches within the Diocese and beyond. Also includes the Diocesan maps that were created by John Clark in 1954 and 2000. Collection of research papers by volunteer Jo Gray on the kneelers of the Cathedral. Includes photographs she took of each of the kneelers, two research books of photographs and descriptions of selected kneelers and other research papers.